"You can tell what kind of gardener you are by your tools... trowel and trug mean you're a primrose and sweet pea sort; wheelbarrow and seed dibber mean you're a potato and marrow person; concrete mixer and socket-set mean what you most like to grow in your garden is a fourth-hand Ford Sierra." See all that nice messy green and red stuff? That stuff is good. That stuff is really good. 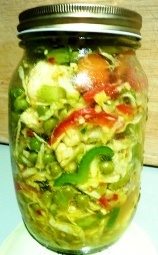 That's called Salad in a Jar... see recipe at the end. If your compost pile or bin is not a thing of beauty to you, hide it! The easiest and I'd have to say one of the most attractive ways I've seen is to plant a ring of sunflowers around your compost pile. Pop the seeds in and watch as your compost soon gets hidden by these tall, sunny beauties dancing in the breeze. You CAN save some spuds from your crop to grow the next season. You do NOT have to buy new seed potatoes each year, unless your old ones are diseased. So by all means buy your first seed spuds, put them in an open paper bag and out of sunlight and watch as the buds shoot out. This is called 'chitting' and for more ever helpful advice on, jump to growing potatoes. I hate to think how many hours it would add up to that I stop working on my computer and watch a bird(s) eating and drinking. Just watching now! For pleasure as well as helpfulness, put a birdbath and/or feeding tray in your garden. A few sprigs of mint in the birdbath water will prevent algae forming. I took this half pint jar to a friends to add to her lunch she was making for us. She still mentions it each time we talk, she loved it so much. Chop all salad ingredients to bite size pieces. Mix in bowl with other ingredients and fill up jar. Keep in fridge until you take to work or friends. Note: So handy, so cool and leak-proof! Anything can go in — tomato, broccoli, cucumber, sunflower seeds, mustard and so on. Make several jars and use each day. Crunchy cabbage, grated carrots, beetroot etc slightly soften as they marinate in the dressing.